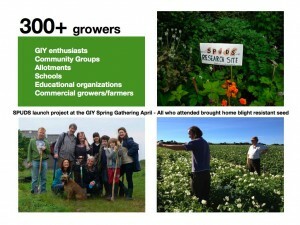 How to feed the world? Let the ‘Lumper’ speak! Judging from Irish Times coverage alone, the re-introduction of the ‘famine spud’, the famously blight susceptible Lumper, by Marks and Spencer has been a sensationally successful PR exercise. But what does this say about social responsibility in the food sector, another subject that has dominated the news recently? 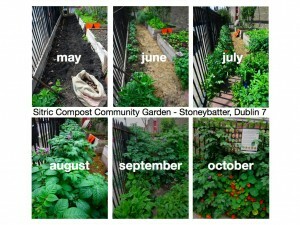 Many people believe that 2012 was the worst year for blight since the famine. Blight is still with us and is becoming an increasingly veracious and adaptive disease which is demanding that our farmers spray fungicides up to 20 times a season. This is now effecting our groundwater and leading to fines from Europe. 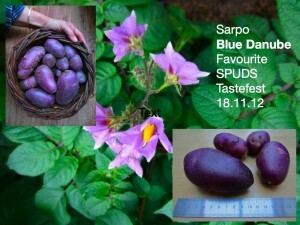 Last year I launched a project called SPUDS, the sustainable potatoes united development study, to explore these issues. 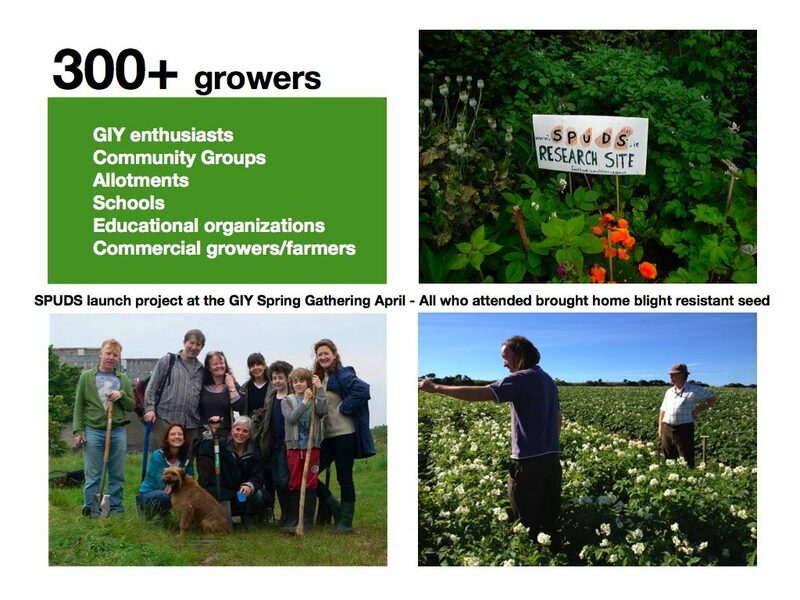 We sourced an ‘off the shelf’ solution and gave away 1.5 tons, three different varieties, of non-gm naturally blight resistant potato seed to over 300 growers (in almost every county in the republic) to test their commercial viability. 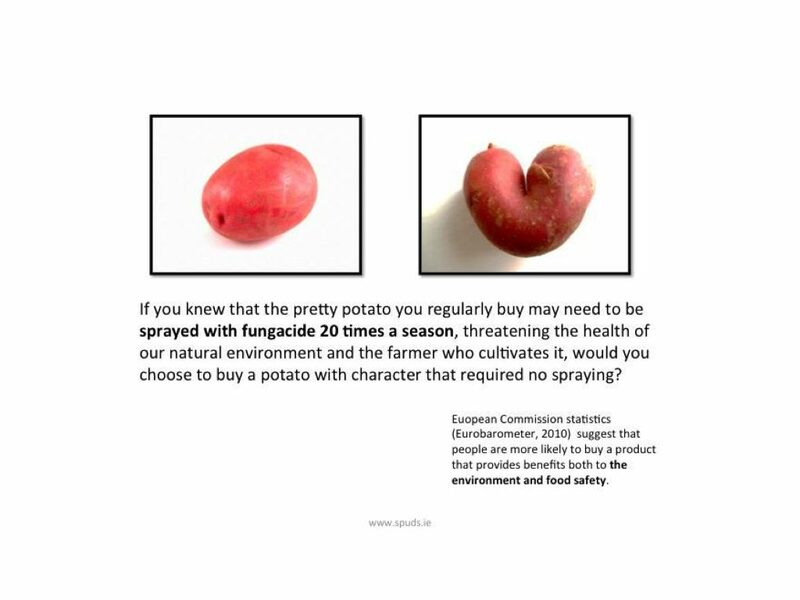 So little was understood about the subject that when we began offering people blight resistant potato seed I was accused of trying to ‘push’ genetically modified (GM) spuds on growers. Of course I was offering them a natural alternative, but the media attention attracted by Teagasc’s application to trial GM blight resistant potatoes gave the impression that there was no other viable option. In fact, a large proportion of the public were unaware that blight was a problem at all, believing the disease disappeared with the famine. This is no surprise when you consider the enormous gap that now exists between the consumer and the producer. Most of us have no idea what challenges the farmers are up against and how many chemicals are required to meet the supermarket’s demand for inexpensive, perfectly presented food. 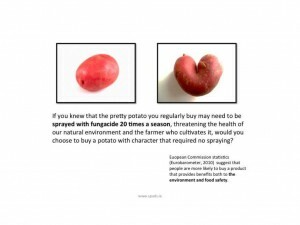 In case of potato farmers, they spend as much on fungicides as they do on seed. If people did know about blight resistant varieties they were convinced that they would require a sacrifice in taste. 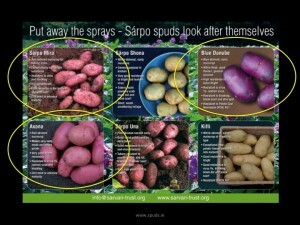 I think this misconception may have been based on the best known Sarpo Mira which can be waxy, floury or starchy and hollow depending when you harvest it. In this case the trick is knowing your variety, and it’s particular characteristics. Even the Rooster, which is not a particularly floury potato, wasn’t instantly popular when it was first introduced, but now it is the standard against which everything else is judged. ast summer when Ireland lost 1/3 of it’s potato crop despite spraying almost every 5 days, our preliminary findings show that the majority of those who participated in our trial didn’t get blight and over 90% thought these relatively new varieties tasted absolutely delicious and are keen to buy them to grow again this year. 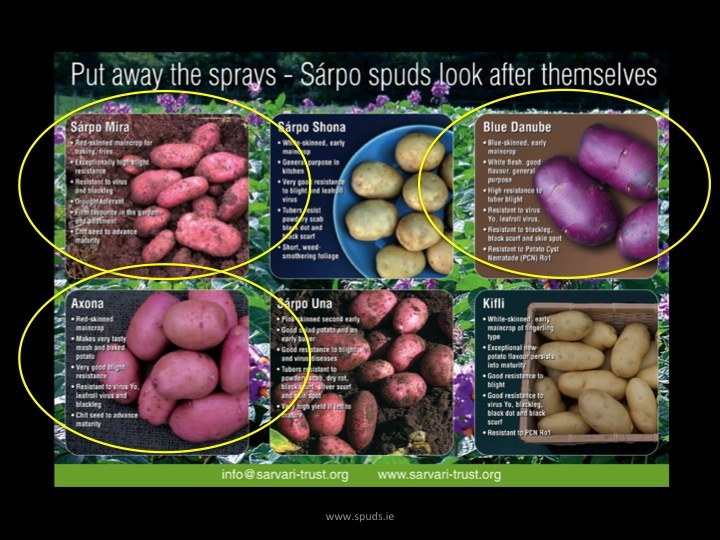 The ‘Sarpo” spuds we tested are also resistant to virus and drought, suppress weeds with their profuse foliage and store at higher temperatures, ticking all the boxes necessary to lower our carbon footprint. 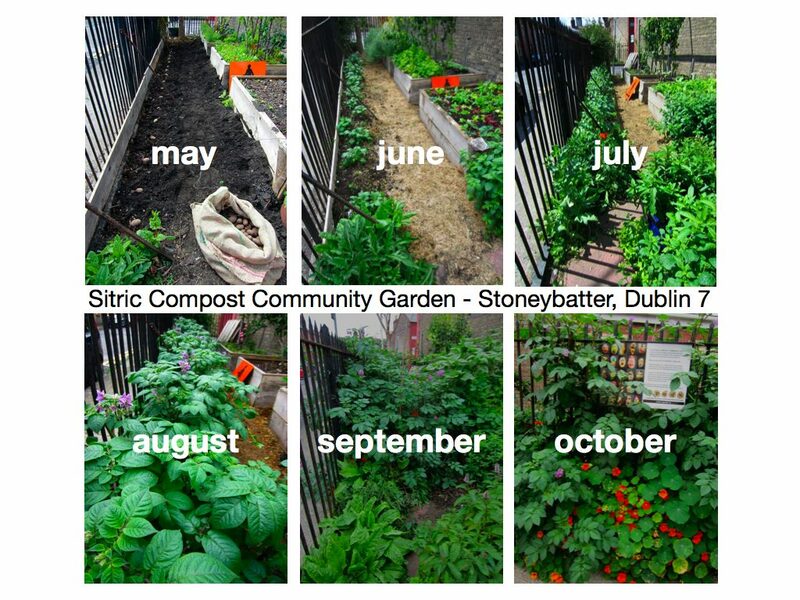 Yes, Michael McKillop of Antrim is right, the ‘Lumper,’ and all spuds, have gotten a bad rap. Potatoes have been blamed for the famine and have fallen victim to misinformation spread through a blitz of diet fads. In fact potatoes are both highly nutritious (one contains 1/2 our daily requirement of vitamin C and more Potassium than a banana) and contain virtually zero fat. Neither the Lumper or blight (Phytophthora infestans) were the cause of the famine. 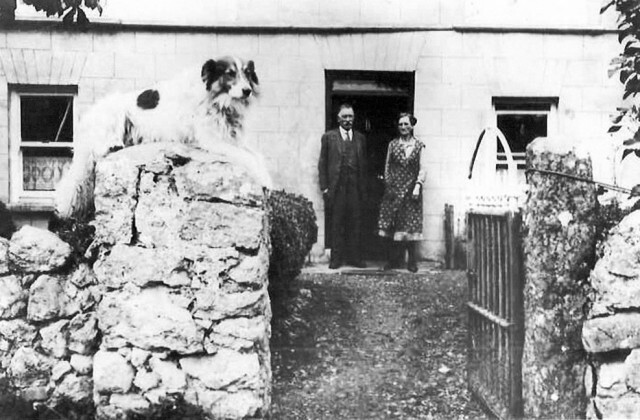 Many countries in Europe, Denmark and the Netherlands for example, and a small community living in Ireland, the ‘Palatines’ (see notes below), were as hard hit by blight during the same period but did not experience famine. The problem was socio-political. Most of the quality food produced in Ireland at that time was being exported to England. Food control and distribution were the issues, and they are as serious a problem today as they were in the 1800’s. We currently produce enough food to feed the world, waste 50% and fail to distribute the remainder efficiently. I applaud Michael McKillop of Antrim for his enterprising spirit. With Bord Bia investing our advertising euros in ‘Origin Green’ to promote Ireland as the home of wholesome, safe food, I suggest we to tap into the ingenuity Michael has used to revive this controversial heritage variety. As Irish growers and consumers we could bring our collective influence to the marketplace and insist that our retailers feature a ‘humble spud’ that will lead us out of a dark past toward the development of a bright sustainable future. 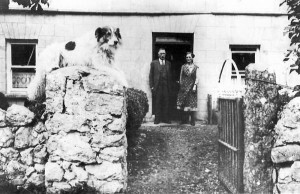 In contrast, the ‘Palatines,’ were a colony of farmers living in Ireland during the famine period, who, unlike the average peasant, were able to secure tenure of their land and cash for their labor (as apposed to rent). This gave them the freedom to cultivate a range of crops and eat a varied diet. They remained relatively unscathed by the famine. More knowledge, less poison, healthier foods, better lives; Thankyou! This message was posted by my mother, Eleanor Jackson Burt Migdal, who suffered a serious stroke on St. Patrick’s Day, soon after registering with desireland.ie and posting this comment. She died a week later, a vital woman up until the last second. Her inspiration lives on! Follow the previous link to an excellent post and recipe for SPUDAKOPITA! What a bright spark Aoife (Daily Spud) Cox was to think of bringing the newly re-marketed ‘Lumper’ to the Organic Centre’s Potato Day for tasting! I was struck by how receptive the audience was to experimentation, and when so many of the seasoned potato enthusiasts in the room found this controversial spud ‘not bad,’ I felt like kicking myself! Why hadn’t I brought some blight resistant varieties to toss into the pot? But there’s another Potato Day (Sonairte, March 23rd) and another chance for that spud tasting show down. Better polish up those Blue Danubes!